My link party is still up all weekend. Go link up! Today I have Alexandra from Happy, Healthy, and Domestic here sharing how she turned a basic pallet into a super cool table. You guys will love this! I am constantly amazed at how many amazing ideas are out there, and this table is no different. Hi HoH readers! I’m so excited to be here guest posting on Allison’s blog! I pretty sure I squealed when I got Allison’s email. I’m Alex, from Happy,Healthy,&Domestic, I have two little boys (3.5 and 1.5) and a little one due in September! I blog about crafts, cleaning, sewing, DIY projects, and healthy recipes. Feel free to come on over and explore a bit! I am loving pallet projects! I mean who can say no to free wood! A while ago my dad was in town visiting and he needed to pick up some flooring from Lumber Liquidators. While we were out back picking it up, we noticed a pallet in the trash and a bunch of wood to the side. We asked if we could have the pallet and 4 of the wood pieces and they said no problem. SCORE!! I started by taking the pallet apart. I removed the wood from the bottom. There were four pieces underneath – two large and two small. I used the smaller pieces on each end. Then I cut the wider pieces down to fit the gaps. I used a few pieces from another pallet for the rest of the gaps. Then I just cut down the four wood pieces to 30” for the legs. Lastly, lots and lots of sanding. My chairs fit it perfectly! So in total, my entire patio “set” cost me a whopping….drum roll please…. $0!!! Seriously, everything was FREE, my parents found the chairs on the curb in their neighborhood!! It’s scalding hot here in Vegas now so we haven’t been able to use it too much, but I’m thinking when fall rolls around, it’ll be awesome for eating outside and sitting and watching my boys play. Feel free to come visit me over at Happy,Healthy,&Domestic and give me a shout out, tell me what awesome stuff you’ve made out of pallets. And I’d love for you to follow along and see the other fun stuff I come up with! That’s a great idea! I’d love one of those out on our patio! 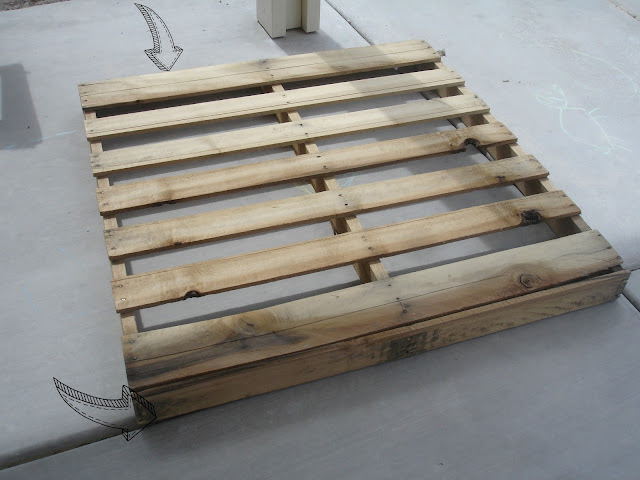 Oooh love pallet projects, this is great!! This is just what I need for my bottle cap table project!! Can you tell me how long the legs are?? This is amazing!! perfect for a little kids table too! I recommend, if you get a power washer from amazon, and really spray the pallets first, it makes them look much tidier and removes a lot of the harmful treatment chemicals!